A rain gage at ICN Stelle. The 19 Illinois Climate Network stations around Illinois. 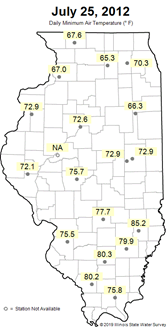 ICN data—including current conditions, daily maps, graphs of weekly trends, and historical records—are available online at www.isws.illinois.edu/warm/. The website also has growing and pest degree day calculators that allows users to customize the calculations to meet their specific needs. “Illinois farmers value the network for data on both current environmental conditions, as well as historical trends. They rely upon the valid third-party data to help them make decisions on the farm, including tools like the growing degree day and pest degree day calculators,” said Lauren Lurkins, director of Natural and Environmental Resources for the Illinois Farm Bureau. The highest air temperature recorded by ICN was 106.2°F at ICN Dixon Springs on June 29, 2012. The warmest daily minimum air temperature recorded by ICN was 85.2°F at ICN Olney on July 25, 2012. 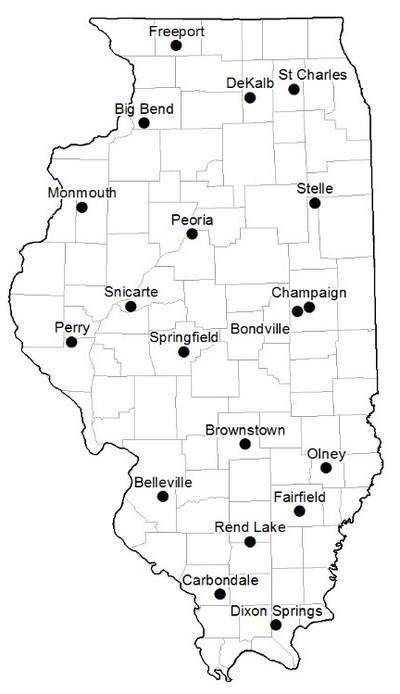 Agricultural meteorologist Steve Hollinger, who retired from the Water Survey in 2004, remembers how the ICN evolved from an initial 16 locations with just thermometers and rain gages to more stations with increasingly sophisticated technology capable of measuring more variables and providing more data. He said improvements in measuring soil moisture were particularly notable. 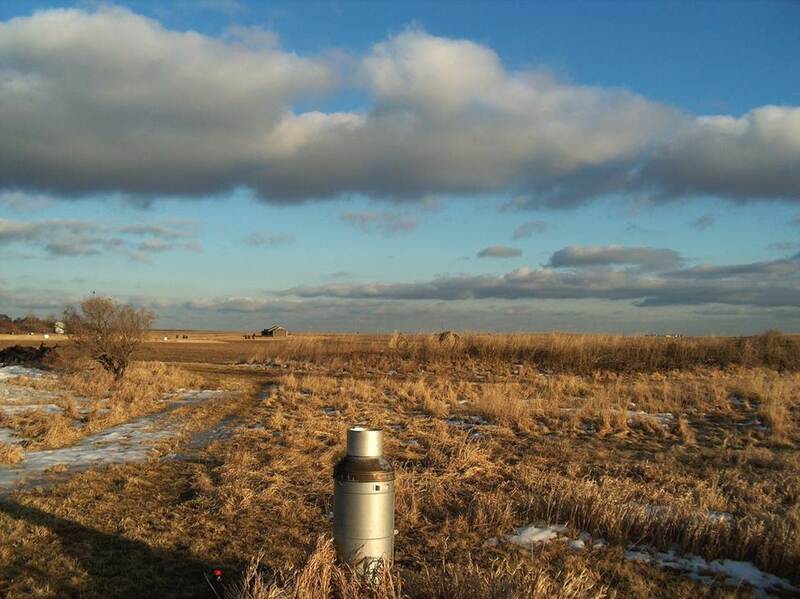 “The unique thing about the ICN is that we have one of the longest records of soil moisture taken on a regular basis from the surface down to about 2 meters. About the mid to late 90s we had regular, continuous soil moisture measurements,” he recalled. Data about the moisture of deep soils can help farmers anticipate how long crops can last without rain and when they will become stressed. Since ICN started collecting data in 1989, the highest wind gust recorded at any of the sites was 83.6 mph at ICN Stelle on April 20, 2000—ICN also recorded 1.13 in. of rain that day. The lowest air temperature recorded by ICN was -32.9° at ICN Big Bend on Jan. 16, 2009; the highest air temperature recorded was 106.2°F at ICN Dixon Springs on June 29, 2012. The coolest daily maximum air temperature recorded by ICN was -17.2°F at ICN St Charles on Jan. 18, 1994, while the warmest daily minimum air temperature was 85.2°F at ICN Olney on July 25, 2012. For more information, visit www.isws.illinois.edu/warm/ or follow the Water and Atmospheric Resources Monitoring Program on Twitter at @WARM_ISWS.